This is my entry for a challenge being held by Cam of CurlyPops. Cam, herself, recently took part in a challenge to incorporate a metre of gold braid into a craft project. She decided to sew herself a rather flash superhero costume (which she kindly modelled on her blog). SuperPops was born! Now in turn, Cam has challenged her readers to depict SuperPops in the art medium of their choice. There have been fabulous entries in playdough, paper, felt, laminex, crochet and more. There's even a SuperPops toilet roll holder! Mine is in watercolour and ink. I couldn't help embellishing SuperPops' outfit a little. 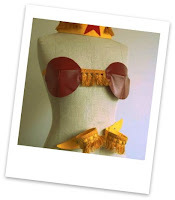 You see when Cam sewed her original costume, she decided it might be a bit over-the-top to add gold braid tassels to the top. So I've taken the liberty of adding them for her ( ... strictly for after-5 wear of course). To see other entries, head on over here. I love seeing your watercolour and ink work. You have wonderful talent. Excellent, love the after-5 tassels, hee hee. love watercolour, it's a beautiful medium and that's a super superpops. There's no way on this planet I would have left off the tassles either. Oh I love your version of superpops. Bravo for including the tassels! I also love the lines near the elbows, suggesting she may be 'shakin it'. It's just fabulous!! you are so very talented. Very cute Liesl, thats one way to get the dusting done! Great boots too! Very sweet, it reminds me of the Little Prince!